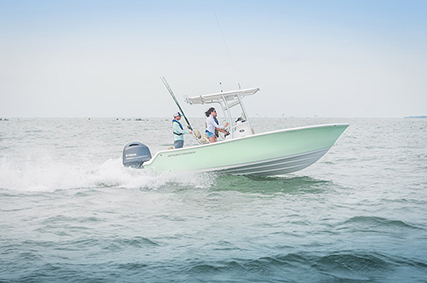 Nautical Boat Club® Mount Pleasant offers a diverse fleet of new fully outfitted boats from industry leading manufactures like Boston Whaler, Key West, Nautic Star & Sportsman fishing boats; Chaparral, Regal & Monterey sport boats, and Harris & Manitou Pontoons and more! 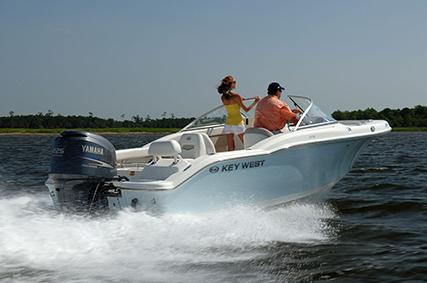 Our Boating Country Clubs® buy new boats each year, and we sell and replace our boats every 2-3 years, so you always have the newest, neatest boats to take out on the water! No matter your desired activity, Nautical Boat Club® has the right style of boat for you to enjoy the Charleston waterways. Features: The Regal 2300 is designed to give you relaxation at every corner. Sit back and enjoy the view with a friend on the Dual UltraLoungers at the transom or stretch out in the spaciously designed cockpit; all finished with the luxurious, eye-catching details. 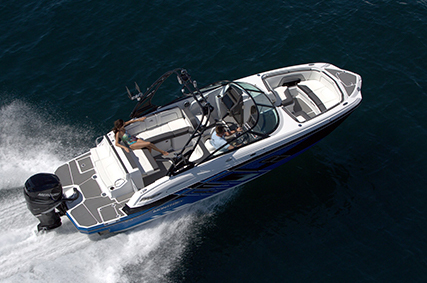 Options include Wake board tower with Board racks, Bimini top, Dual 4-position reversible loungers, Swim platform with Boarding ladder, and Ski storage locker. Electronics include Simrad GPS & Depth finder, Compass, and Stereo with Aux Input. 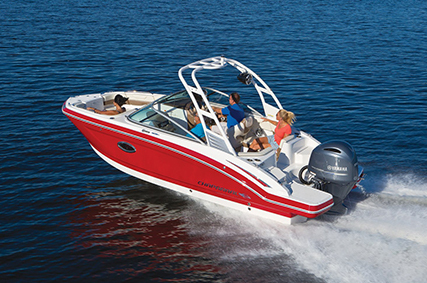 Features: This Sport boat is HUGE with wrap around cockpit seating and a rear facing lounger. Options include Wake board tower with Board racks, Bimini top, Huge swim platform with Boarding ladder, and Ski storage locker. Electronics include Simrad GPS & Depth finder, Compass, and Stereo with Aux Input. Features: This versatile Tritoon with center walk through to the stern features a bar with 3 stools for snacking or lunch plus an optional propane grill for picnics. 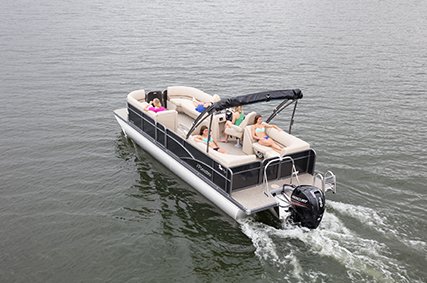 Options include Triple tube with Lifting strakes, Bimini top, Boarding ladder and Ski tow bar. Electronics include Simrad GPS & Depth finder, Compass, and Stereo with Aux Input. Features: This Performance tritoon is fitted with a larger center toon plus lifting strakes for extra speed and performance. The floor plan features a center walk through to the stern that maximizes seating space with Stern radius seating. Options include Triple tube with Lifting strakes, Bimini top, Boarding ladder and Ski tow bar. Electronics include Simrad GPS & Depth finder, Compass, and Stereo with Aux Input. 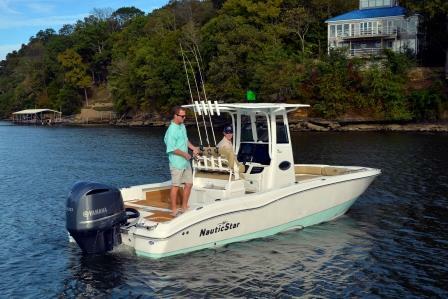 Features: Do some serious Fishing in this Center Console or request the optional Bow and Stern cushions for Cruising or Tubing. Options include T-Top, Boarding ladder, Ski tow bar, Live well, and Rod holders. Electronics include twin Simrad NSS EVO3 displays for GPS & Fish finder w/ structure scan plus a Compass and Stereo with aux input. 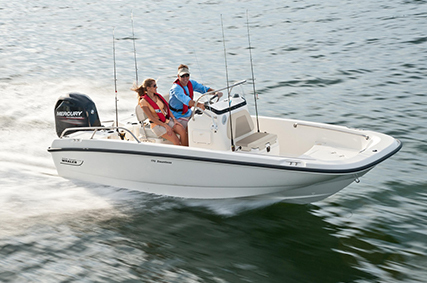 Features: This classic boat by Boston Whaler will do everything from flats fishing to skimming across the harbor. Options include Bimini top, Boarding ladder, Ski tow pylon, Live well, and Rod holders. Electronics include Trolling motor, Hook 7 Fish finder & GPS, Compass and Stereo with aux input. 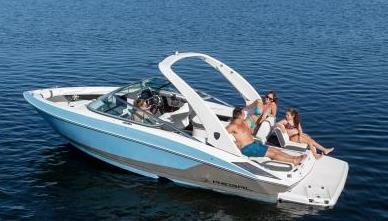 Features: Enjoy a comfortable and dry ride in this Deep-V sport boat with Sport seating package. Options include Wake board tower with Board racks, Bimini top, Swim platform with Boarding ladder, and Ski storage locker. Electronics include GPS, Depth finder, Compass and Stereo w/ Aux input. 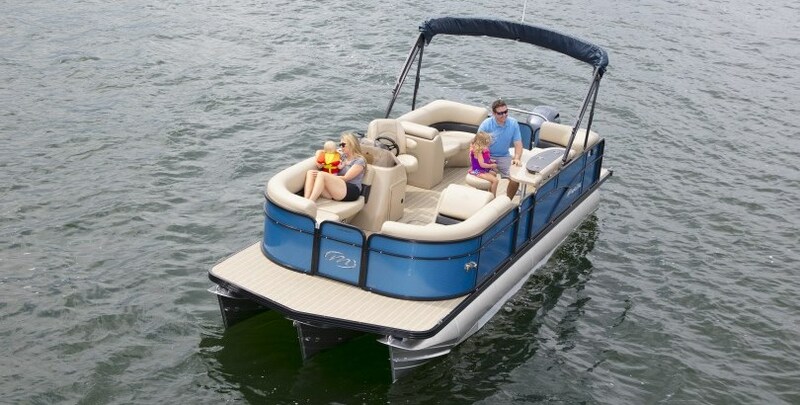 Features: Fish, Ski, or Cruise in this versatile Dual Console with optional Bow and Stern cushions. Options include Bimini top, Boarding ladder, Ski tow bar, Live well, and Rod holders. Electronics include Hook 7 Fish finder & GPS, Compass and Stereo with aux input.